Gene therapy holds great promise for the treatment of many conditions but it is currently limited by the inability to effectively introduce the transgene into the tissue of interest, as well as low level and transient transgene expression. Furthermore, once long term transgene expression is achieved, it will need to be responsive to regulation via normal homeostatic mechanisms or via pharmacologic means. These hurdles are significant and limit the current application of gene therapy in many areas, but may pose less of an issue in the context of transplantation. Trans-plantation is a relatively unique setting where one might envision gene therapy being applied in situ to the cadaveric donor prior to organ retrieval, or ex vivo prior to implantation of the cells or organ into the recipient, allowing for higher doses of vector to be administered without systemic toxicity. Furthermore, this selective perfusion of the organ ex vivo provides a functional tissue specificity independent of vector design, a current hurdle for in vivo gene therapy in other applications. 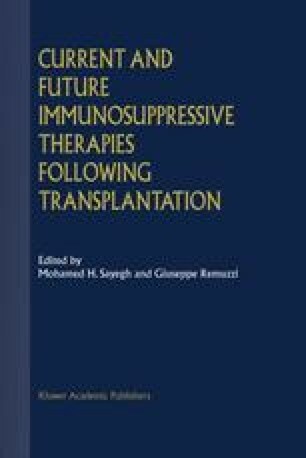 The transient expression of the transgene, while a shortcoming in applications such as gene replacement therapy, may actually be bene?ficial in the context of transplantation. The limited expression of an immunomodulatory molecule in the microenvironment of the graft may be sufficient to alter the interaction between the donor antigens and the recipient immune system so that a state of donor specific hypores-ponsiveness or functional tolerance is generated.